Belgian corporate governance practices for listed companies have been partially codified in the Belgian Company Code (BCC). The BCC contains mandatory provisions on, for example, the establishment of an audit committee and a remuneration committee, requirements with respect to the determination and disclosure of executive remuneration, requirements for independent directors, and the issuance of a corporate governance statement. Compliance with these mandatory provisions is ensured, for the most part, by the listed company’s auditor and the Financial Services and Markets Authority (FSMA). In addition, other financial and ad hoc disclosure requirements for listed companies are laid down in the Royal Decree of 14 November 2007 on the obligations of issuers whose financial instruments are admitted for trading on a regulated market. Listed companies must also disclose the transparency notices they receive from their shareholders pursuant to the Act of 2 May 2007 and the Royal Decree of 14 February 2008. In 2010, the 2009 Code was named the mandatorily applicable corporate governance code for certain listed Belgian companies, more specifically those whose shares are listed on a regulated market (in Belgium or another Member State of the European Economic Area (EEA)) or whose shares are traded on a multilateral trading facility (MTF) (i.e., in Belgium, mainly the Vrije Markt/Marché Libre and Alternext),4 provided they have other securities listed on a regulated market (e.g., in Belgium, Euronext Brussels or the market for derivatives of Euronext Brussels). The BCC obliges such companies to adhere to the provisions of the 2009 Code or to explain in their corporate governance statement, which forms part of the annual report, why they have not done so, assuming of course that the provisions in question are not of mandatory application. This means that listed companies that fail to explain why they have not abided by certain provisions of the 2009 Code will be deemed to be in violation of Belgian law. In other words, listed companies are not required by law to comply with the 2009 Code, but they are required to explain why they have not done so. In addition, compliance is highly recommended since it gives credibility and authority to listed companies. Non-compliance can indeed adversely affect public opinion about a company. The Belgian corporate governance rules have thus evolved over the past few years from soft law (the Lippens Code and the 2009 Code) to hard law (BCC), and the process is ongoing. The 2009 Code will be reviewed in 2017. The Corporate Governance Committee wishes to update the 2009 Code and incorporate the changes in the BCC.5 European legislation is often the driving force behind Belgian legislative proposals. One of the most important recent legislative actions in the area of corporate governance is the adoption of rules that oblige listed companies to ensure that at least one-third of the members of their board of directors is of a different gender than the other members.6 This action is based on a January 2011 recommendation on gender diversity of the Corporate Governance Committee. Indeed, the means of increasing the number of women on management boards has been widely debated. The legislature finally decided to use hard law rather than soft law (such as a recommendation in the 2009 Code) to achieve this goal. Specific, more stringent corporate governance rules are applicable to financial institutions. In addition to the 2009 Code, which is applicable to listed companies, the Buysse Code II contains corporate governance recommendations for unlisted companies. The Buysse Code II was published in 2009 to update the Buysse Code 2005; compliance with this code is voluntary in nature. 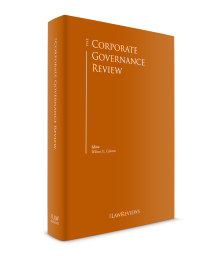 This chapter, however, focuses only on the corporate governance rules applicable to listed companies. In Belgium, listed companies usually take the form of a limited company (NV/SA).7 Companies with other corporate forms can be listed if their shares are freely transferable. The basic governance structure of an NV/SA is a one-tier model, whereby the board of directors holds all powers except those specifically reserved by law or the articles of association to the general meeting of shareholders. Limitations on the powers of the board of directors set out in the articles of association are not enforceable against third parties and have internal effect only. The board of directors should be composed of at least three directors (or two if there are only two shareholders in the company and the articles of association so provide). The BCC allows the board of directors to delegate daily management of the company, and the external representation of the company in that respect, to another person, who may also be a director. Limitations on the powers of the daily manager, either set out in the articles of association or adopted by the board of directors, are not enforceable against third parties and have internal effect only. This person is generally known as the CEO, managing director or general manager. The board of directors still has authority to take decisions with respect to the delegated powers. The BCC allows companies to adopt a two-tier governance model if their articles of association provide for this possibility. In this model, the board of directors delegates (some of) its powers to a management committee, except those reserved to it by law and general corporate policy. Limitations on the powers to be delegated can either be set out in the articles of association or adopted by the board of directors. Again, such limitations are not enforceable against third parties and have internal effect only. If the board of directors thus delegates all of its powers except those reserved to it by law and general policy, it becomes in fact a supervisory board and can no longer take management decisions. Very few listed companies have adopted a two-tier governance model. The most common governance model in listed companies, and the basis for the 2009 Code, is the one-tier model, whereby the board of directors delegates daily management to the CEO, who is assisted by a number of executive managers (who may or may not be directors), for example, the chief operating officer, the chief financial officer or the chief legal officer. Together, they constitute the company’s executive management. The powers of the executive managers, other than the CEO, to represent the company for the purposes of certain acts derive from a special authorisation granted by the board of directors or the CEO. In addition to representation by the CEO (for matters of daily management) and other executive managers (within the limits of their specific powers), the company can also be represented externally by a majority of its directors, acting jointly, or by a person appointed to this end in the articles of association (often two directors acting jointly, the chair, the CEO, etc.). The company will be bound by any acts taken or obligations incurred by these individuals, even if the internal decision was not taken by the correct corporate organ (unless the counterparty acted in bad faith). Quantitative limitations (e.g., representation for transactions with a value of up to €100,000) on the external representation powers of the CEO or the persons appointed in the articles of association to represent the company are not enforceable against third parties and have internal effect only. describe the main features of the company’s internal control and risk management systems (disclosed in the corporate governance statement). be responsible and accountable to the board for the discharge of its responsibilities. The Act of 28 July 2011 introduced Article 518 bis into the BCC, which stipulates that at least one-third (rounded to the nearest whole number) of the board of directors of companies whose securities are listed on a regulated market should be of a different gender than the other members. If the required number of directors of the less-represented gender is not met, the next appointed director should be of that gender. If not, the appointment shall be deemed null and void. The same holds true if an appointment would cause the number of directors of the other gender to drop below the required minimum. This requirement and sanction are applicable as from the first day of the sixth financial year that starts to run after 14 September 2011. For listed companies whose free float9 amounts to less than 50 per cent and for small listed companies,10 this requirement and sanction are applicable as from the first day of the eighth financial year beginning after 14 September 2011. The 2009 Code assigns a clear role to the chairperson of the board of directors. The chair and the CEO should not be the same person, and there should be a clear division between duties related to the running of the board (chair) and the management of the company’s business (CEO). This division of responsibilities should be clearly established, set out in writing and ratified by the board. The chair should cultivate a close relationship with the CEO, providing support and advice while fully respecting the CEO’s executive responsibilities. As a guideline, the chair should stimulate effective interaction between the board and executive management. The chair is responsible for leading the board of directors and can be entrusted by the board with specific responsibilities. The chair should take the necessary measures to foster a climate of trust within the board, contribute to open discussion, allow constructive dissent and ensure support for the board’s decisions. The chair determines the agenda for board meetings, after consultation with the CEO, and ensures that procedures relating to preparations for board meetings, deliberations, the adoption of resolutions, and the implementation of decisions are properly followed. The chair is responsible for ensuring that the directors receive accurate, timely and clear information before the meetings and, where necessary, between meetings. All directors should receive the same information. The BCC obliges companies13 whose shares are listed on a regulated market to set up a remuneration committee composed of non-executive directors, a majority of whom should be independent.14 The members of the remuneration committee must possess the requisite level of expertise in the area of remuneration policy. The chair of the board of directors or another non-executive director should head the remuneration committee. The remuneration committee should meet at least twice a year and whenever it deems necessary to carry out its duties. The remuneration committee should report regularly to the board of directors on the exercise of its duties. The CEO should attend meetings of the remuneration committee when the committee is discussing the remuneration of executive management. The remuneration committee should submit proposals to the board of directors on the company’s remuneration policy and on the individual remuneration of directors and executive managers and, where appropriate, on proposals to be submitted by the board of directors to the general meeting of shareholders (i.e., proposals on the remuneration of directors). The remuneration committee also prepares the remuneration report that forms part of the annual report and provides explanations on this report at the annual general meeting of shareholders. The 2009 Code provides for practically the same requirements with respect to the remuneration committee. The 2009 Code further specifies, however, that the remuneration committee should have at least three members and should submit proposals to the general meeting of shareholders on the remuneration of directors and executive managers, including proposals on variable remuneration and long-term incentives, such as the grant of stock options or other financial instruments and arrangements for premature termination. The remuneration committee should review (at least every two to three years) its terms of reference and its own effectiveness and recommend necessary changes, if any, to the board. In addition to a remuneration committee, the BCC obliges companies whose securities are listed on a regulated market15 to set up an audit committee, composed of non-executive directors. At least one member should be independent16 and must possess the requisite level of expertise in the area of accountancy and audits. The audit committee should report regularly to the board of directors on the exercise of its duties and in any case when the board draws up the annual accounts, consolidated annual accounts and the short-form financial statement (intended for publication). The audit committee should monitor the financial reporting process, the effectiveness of the company’s internal control and risk management systems, the internal audit – if any – and its effectiveness, the audit of the annual and consolidated accounts, including the follow-up of any questions and recommendations by the statutory auditor, and review and monitor the independence of the statutory auditor, in particular with respect to the provision of additional services to the company. The statutory auditor should report to the audit committee on key matters arising from the audit of the annual accounts, in particular on material deficiencies in internal control of the financial reporting process. The statutory auditor shall confirm to the audit committee annually, in writing, its independence from the company, inform the audit committee on an annual basis of any additional services provided to the company, and examine, together with the audit committee, the risks to its independence and the safeguards to be implemented to minimise these risks. The audit committee should make a proposal on the appointment or reappointment of the statutory auditor or external auditor, which should be placed on the agenda of the general meeting. The requirements of the 2009 Code with respect to the tasks and duties of the audit committee are much more detailed and give further guidance as to what should be done to fulfil the mandatory tasks set out above. The 2009 Code also indicates, inter alia, that (1) the audit committee should have at least three members, (2) at least half of the audit committee’s members (versus one in the BCC) should be independent, and (3) the chairperson of the board of directors cannot also chair the audit committee. The audit committee should meet at least four times a year and review (at least every two to three years) its terms of reference and its own effectiveness and recommend any necessary changes to the board. The committee should meet with the external and internal auditors at least twice a year to discuss the audit process. An independent internal audit function should be established, or at least once a year it should be considered whether this is necessary. In June 2012, the Corporate Governance Committee issued additional advice in relation to the audit committee’s proposal regarding the (re)appointment of the statutory auditor or external auditor. The Committee advised that when appointing an auditor, the audit committee should solicit offers on the basis of predetermined selection criteria (e.g., technical skill, price, financial and economic expertise). The audit committee should also review the work of the statutory or external auditor every three years with a view to the submission of a proposal to the board of directors on the reappointment of the auditor. The board in turn will forward the proposal to shareholders and, if applicable, the works council. The 2009 Code introduced a third committee, namely the nomination committee, whose duties may also be exercised by the remuneration committee, in which case it shall be known as the remuneration and nomination committee. The nomination committee should have at least three members, a majority of whom should be independent non-executive directors. The chair of the board of directors or another non-executive director shall chair the nomination committee. The chair cannot preside over meetings of the nomination committee when the committee is discussing the appointment of the chair’s successor. The nomination committee should make recommendations to the board with regard to the appointment of directors, the CEO and other executive managers and should consider proposals made by relevant parties, including management and shareholders. It should meet at least twice a year and review (at least every two to three years) its terms of reference and its own effectiveness and recommend any necessary changes to the board. The 2008 financial crisis led to an animated debate on the (at times excessive) remuneration of directors and executive managers of Belgian companies. In an attempt to rein in the remuneration of directors and executive managers, several new provisions were adopted in 2010 and codified in the BCC. As a general rule, the general meeting of shareholders has exclusive power to determine the remuneration of directors. The board of directors, in turn, determines the remuneration of executive management, unless the company’s articles of association provide otherwise. In listed companies, the articles of association sometimes provide that the shareholders’ general meeting determines the overall remuneration for the board of directors as a whole, while the board itself decides how to distribute this total amount among its members. The BCC stipulates that the remuneration of individual directors and executive managers shall be determined further to a proposal by the remuneration committee. The remuneration committee should also submit proposals on the company’s remuneration policy, which must be explained in the remuneration report that forms part of the board’s annual report. The general meeting of shareholders need not approve the remuneration policy per se but does have the power to vote on the remuneration report in which the remuneration policy is described. There are no consequences, however, if the general meeting rejects the remuneration report. The remuneration report should also be provided to the works council or, in the absence thereof, the employee representatives on the committee for prevention and protection at work or, if there is no such committee, the trade union representatives. If an executive manager receives variable remuneration (i.e., remuneration linked to performance), the criteria used to determine the remuneration should be set out in the contractual or other provisions governing the company’s relationship with the manager, and payment can only take place if these criteria have been met within the specified time period. If this is not the case, the executive’s variable remuneration cannot be taken into account to determine his or her severance package. If the variable remuneration of an executive manager of a listed company makes up more than one-quarter of his or her annual remuneration, at least 25 per cent of the variable remuneration should be based on previously established and objectively verifiable performance criteria measured over a period of at least two years, and at least another 25 per cent should be based on previously established and objectively verifiable performance criteria measured over a period of at least three years, unless the articles of association provide otherwise or the general meeting of shareholders expressly consents to deviate from this rule. Unless the articles of association provide otherwise or the general meeting of shareholders expressly agrees, shares shall only be finally acquired and share options or any other rights to acquire shares shall only be exercisable by a director or executive manager of a listed company after a holding period of at least three years is satisfied. The general meeting of shareholders should also approve in advance17 any severance package agreed by the company with an executive manager if the severance pay amounts to more than 12 months’ remuneration, as well as any variable remuneration granted to an independent or non-executive director.18 If the severance package represents more than 18 months’ remuneration, a reasoned opinion from the remuneration committee is also required. Any such contractual provision that has not been approved by the general meeting shall be deemed null and void. The proposal should also be notified to the works council or, if there is none, the employee representatives on the committee for prevention and protection at work or, in the absence thereof, the union representatives. severance pay should not exceed 12 months’ fixed and variable remuneration. Further to a special recommendation of the remuneration committee, the severance package can amount to 18 months’ fixed and variable remuneration. In any case, the severance package should not take into account variable remuneration or exceed 12 months’ fixed remuneration if the departing CEO or executive manager did not meet the agreed performance criteria. The 2009 Code also adds that the prior approval of the general meeting of shareholders is required for schemes that provide for the remuneration of executive managers with shares, options or any other right to acquire shares. The 2009 Code further provides that the remuneration of non-executive directors should take into account not only their role as ordinary board members but also any specific positions they may hold, such as chair of the board, or chair or member of a board committee, as well as their resulting responsibilities and commitments in terms of time, and that non-executive directors should not be entitled to performance-based remuneration such as bonuses, long-term stock-based incentive schemes, or fringe or pension benefits. The 2009 Code indicates that both executive and non-executive directors, regardless of whether the latter are independent or not, should exercise independence of judgement in their decisions. Directors should make sure they receive detailed and accurate information and should study this information carefully so as to acquire and maintain a clear understanding of the key issues relevant to the company’s business. They should seek clarification whenever they deem it necessary to do so. While executive and non-executive directors are part of the same body (namely, the board of directors), they play complementary roles on the board. The 2009 Code stipulates, as a guideline, that executive directors should provide all relevant business and financial information needed for the board to function effectively. Non-executive directors should constructively challenge and help develop strategy and key policies proposed by executive management. They should also scrutinise the performance of executive management in meeting agreed goals. Non-executive directors should be made aware of the extent of their duties at the time of their appointment, in particular the time commitment involved. They should not consider taking on more than five directorships in listed companies. Changes to commitments and the assumption of new commitments outside the company should be reported to the chairperson of the board, as they arise. Pursuant to the BCC, a director can be either a natural person or a legal entity. In the latter case, a permanent representative should be appointed from among the entity’s shareholders, directors, members of executive management or personnel, who is solely responsible for performing this office in the name and on behalf of the legal entity. The representative shall be liable for the performance of this office as if he or she had been appointed in his or her own name, notwithstanding the joint liability of the legal entity that is represented. The directors of autonomous governmental companies, public institutions and any legal entities over which the state exerts direct or indirect influence19 must be natural persons if they are remunerated for the directorship.20 Any payment to a legal entity, acting as director, in this case will be deemed null and void. A listed company that falls into any of the aforementioned categories (e.g., Proximus Group NV) must ensure that its remunerated directors are natural persons. Directors cannot use the information obtained in their capacity as directors for purposes other than the exercise of their functions. They have an obligation to treat confidential information received in their capacity as directors with care. Each member of the board should arrange his or her personal and business affairs so as to avoid direct and indirect conflicts of interest with the company. Transactions between the company and its board members should take place at arm’s length. The board should establish a policy for transactions or other contractual relationships between the company, including its related companies, and its board members, which are not covered by the statutory provisions on conflicts of interest. This policy should be disclosed in the company’s corporate governance charter. Comments on the application of this policy should be included in the corporate governance statement (which forms part of the annual report). The BCC indicates a specific procedure to be followed when directors have a pecuniary conflict of interest with the company. In listed companies, a director with a conflict of interest of a financial nature cannot participate in the deliberations or vote on the decision in question. The board should also take all necessary and useful measures to ensure effective and efficient execution of the Belgian rules on market abuse. It should draw up a set of rules (the dealing code) regulating transactions (and the disclosure thereof) in shares of the company or in derivatives or other financial instruments linked to shares carried out for their own account by directors or other persons with managerial authority. Directors can be held liable for shortcomings in the performance of their official duties in accordance with the applicable statutory provisions. For a violation of the law or the company’s articles of association, directors can be held jointly and severally liable (unless they were not personally involved in the violation and brought it to the attention of the company’s shareholders at the first general meeting after becoming aware of it). In addition, directors can be held liable in a number of specific circumstances (e.g., in the event of bankruptcy, a conflict of interest or tax liability). Companies whose securities are listed on a regulated market22 must publish annually and biannually23 a financial report. These listed companies are also obliged to publish ad hoc information if the information in question can be considered inside information. The annual financial report must contain the annual accounts and consolidated annual accounts, the board’s annual report (including the BCC requirements, such as the corporate governance statement and remuneration report), and a number of specific items that could have consequences in the event of a takeover24 (e.g., shareholder agreements or limitations on the transferability of shares and securities), the statutory auditor’s report and a declaration by the issuer on the faithful nature of the accounts and report. If the issuer decides to publish a communication between the end of the financial year and publication of the annual financial report, this communication should meet certain criteria. The biannual financial report should contain interim financial statements and an interim report, information on external control and a declaration by the issuer regarding the faithful nature of the statements and report. Listed companies are subject to other disclosure requirements with respect to any changes in the conditions, rights and guarantees linked to their securities, special reports of the board of directors, and draft amendments to the articles of association. Listed companies should also disclose the transparency notices they receive from their shareholders in accordance with the Act of 2 May 2007 and the Royal Decree of 14 February 2008. In addition to the disclosures set out above, the 2009 Code indicates that the company should draw up a corporate governance charter describing the main aspects of its corporate governance policy and containing the minimum information set out in the 2009 Code. The charter should be updated as often as necessary to reflect the company’s corporate governance at all times. It should be made available on the company’s website and should specify the date of its most recent update. a statement that the company has adopted the 2009 Code as its reference code. The board of directors should also include a corporate governance statement in its annual report, describing all relevant corporate governance events that have taken place in the past year. This statement should be included in a specific section of the annual report and should contain the minimum information set out in the 2009 Code. If the company has not complied fully with one or more provisions of the Code, it should explain its reasons for not doing so in its corporate governance statement (the ‘comply-or-explain’ principle). The BCC has made a corporate governance statement mandatory. an overview of the efforts taken to ensure that at least one-third of the members of the board of directors are of a different gender than the other members. a general description of the main features of the company’s internal control and risk management systems. As mentioned above, the BCC indicates that the corporate governance statement should also include a remuneration report, prepared by the board of directors further to a proposal of the remuneration committee. other components of remuneration, such as the cost or monetary value of insurance coverage and fringe benefits, with an explanation of the details of the main components. if an executive manager (including the CEO) leaves the company, the decision of the board of directors, further to a proposal of the remuneration committee, on whether the person is eligible to receive a severance package and the method used to calculate the severance pay. The 2009 Code adds that the remuneration report should also explain whether, with respect to the disclosure of the remuneration of the CEO and other executive managers, the company has materially deviated from its remuneration policy during the financial year. If, on or after 1 July 2009, the contract of the CEO or any other executive manager provides for a severance package in excess of 12 months’ (but less than 18 months’) base and variable remuneration, the remuneration report should indicate the circumstances under which the severance package can be paid, and a justification for the payment, on an individual basis. In 2012, the FSMA conducted its third annual study27 on compliance with the 2009 Code and found that significant progress has been made over the past three years. The main improvements related to the remuneration report, in that no company found it necessary to ‘explain’ non-compliance in its 2011 annual report. Many of the recommendations set out in the first two studies have been taken into consideration by Belgian listed companies. The FSMA points out, however, that its recommendation to specifically mention when a provision is not applicable, which would further increase transparency, is not yet followed by all companies. It also specifically points to the requirement to mention the following with respect to each executive manager (including the CEO) in the annual report (on the basis of the BCC): (1) provisions on severance pay and (2) whether the company has the right to recover any variable remuneration granted on the basis of incorrect financial data. These requirements are not set out in the 2009 Code, only in the BCC. The FSMA makes some further recommendations to companies to improve the quality of their corporate governance disclosures. One-on-one contacts between directors and majority or institutional shareholders are common in listed companies; such contacts should comply with the rules set out in Section V.iv, below. In February 2015, the Belgian supervisory authority, the Financial Services and Markets Authority (FSMA), published a study on the disclosure by listed companies of relations and transactions with related parties. As a follow-up, the Corporate Governance Committee issued in February 2016 an additional explanatory note on how listed companies should report on their related-party transactions. The explanatory note is structured around three main lines: the legal framework, practical considerations and a number of explanatory annexes. In 2016, the Corporate Governance Committee made a comparative study of the quality of the ‘explain’ principle applied in the different EU Member States. They came to the conclusion that in Belgium the quality of the application of the principle was insufficient (too formal and superficial explanations) compared with the United Kingdom and Sweden (because their governance codes contain stricter guidelines on high-quality explanations). In May 2016, the Corporate Governance Committee issued guidelines to increase the quality required of the explanations. The report on the main differences between the 2009 Code and the Lippens Code notes that corporate social responsibility and diversity have become increasingly relevant topics over the past few years. However, the objective of the 2009 Code is to issue broad recommendations on how companies should be directed, managed and controlled, without going into each and every aspect of corporate responsibility. In view of the importance of issues such as corporate social responsibility and diversity, however, it was deemed appropriate to insert a supplementary guideline in the 2009 Code and indicate that people governance is another area of concern raised during the public consultation on the 2009 Code. Unlike financial institutions, which have specific rules on compliance policies and risk management, there are currently few specific rules on compliance and risk management for listed companies. The only provision in the 2009 Code is that an independent internal audit function should be established, with resources and skills adapted to the company’s nature, size and complexity, and that if the company does not have such a position, the need for one should be reviewed at least annually. The effectiveness of the internal control and risk management systems set up by executive management should be monitored by the audit committee at least once a year, with a view to ensuring that the main risks (including those relating to fraud and compliance with existing legislation and regulations) are properly identified, managed and disclosed in accordance with the procedures approved by the board. The 2009 Code further indicates that the audit committee should review the specific arrangements in place that staff may use to raise, in confidence, concerns about possible improprieties in financial reporting or other matters. If deemed necessary, arrangements should be made for the proportionate and independent investigation of such matters, appropriate follow-up actions and schemes whereby staff can inform the chairperson of the audit committee directly. It should be noted that the rules on personal data protection should of course be respected when establishing a whistle-blowing scheme. On 18 December 2014, the Institute of Internal Auditors (IIA) Belgium and the Institute of Company Auditors, together with the Belgian Association of Listed Companies, issued further practical guidelines for an effective relationship between the audit committee, the internal auditor and the external auditor. These guidelines are supported by the Corporate Governance Committee. Controlling shareholders often have the right to appoint a majority of the company’s directors, so that they de facto influence the management of the company. Any powers not granted by law or the company’s articles of association to the general meeting of shareholders are reserved to the board of directors. A number of decisions are reserved by law to the general meeting and cannot be delegated30 to the board of directors, such as approval of the annual accounts and discharge of the directors and statutory auditor, the final appointment of directors and the statutory auditor, the initiation of claims by the company against the directors, dissolution of the company, a merger, division, etc. In 2010, a number of decisions relating to the remuneration of executive managers and directors were also made subject to the approval of the general meeting (see above). any other reason set out in the BCC. In addition, dispute resolution procedures are available to shareholders pursuant to which they can be obliged to sell their shares or purchase the shares of other shareholders in the event of a serious conflict among them (Articles 635 to 644 BCC) or the involuntary dissolution of the company can be requested, as a last resort (Article 645 BCC). One or more shareholders who, individually or collectively, hold one-fifth of the share capital can also request the board of directors and the statutory auditor to call a general meeting. It is generally accepted that these shareholders also have the possibility to determine the agenda for the meeting. In accordance with Article 533 ter of the BCC, shareholders holding at least 3 per cent of the share capital of a listed company have the right to submit proposals regarding items on the agenda and propose resolutions (this does not apply to meetings held on second call (i.e., meetings called because the required quorum was not met at the first meeting). Shareholders also have the right to ask the directors (and the statutory auditor) questions during general meetings or in writing before the meeting (to be answered at the meeting). The directors or the statutory auditor, as the case may be, have a duty to answer these questions. There is, however, an exception to this rule: directors and the statutory auditor can refuse to answer a question if doing so would cause harm to the business of the company or violate their or the company’s duty of confidentiality. The questions should relate to items on the agenda or to a report prepared by the board of directors or the statutory auditor. Questions on the same topic may be consolidated and answered together. One or more shareholders owning at least 95 per cent of the securities to which voting rights are attached can initiate a squeeze-out to obtain 100 per cent of all voting securities or securities that allow their holders to acquire voting securities. The 2009 Code stipulates that, in companies with one or more controlling shareholders, the board should endeavour to have the controlling shareholders make considered use of their position and respect the rights and interests of minority shareholders. The board should encourage the controlling shareholders to respect the 2009 Code. Aside from this reference, there are no specific duties or best practices in the corporate governance rules pertaining to controlling shareholders and institutional investors. The general rule of law that minority shareholders can seek to invalidate a resolution of the general meeting on the grounds of abuse of majority still applies, of course. Such a request must be made within six months of the time the resolution became enforceable against the shareholder or was notified to the shareholder. Pursuant to this principle, a resolution can be invalidated if the voting rights were not exercised in the company’s interest or the voter abused his or her rights, meaning the voting rights were exercised in an obviously unreasonable manner. As indicated above, the general meeting of shareholders normally determines the remuneration of directors, but not of executive managers (except for the approval of severance pay in certain cases), so it does not have a complete ‘say on pay’. The general meeting of shareholders has the power to vote separately on the remuneration report in which the remuneration policy is described, but there are no consequences if it rejects the report. If one or more shareholders do not agree with the board’s management of the company, there is judicial relief available to them. The BCC does not contain express rules on the invalidation of resolutions by the governing body (i.e., the board of directors); however, based on general rules of law, the courts tend to accept that resolutions of the board of directors can be declared null and void at the request of any interested party (including a shareholder). Directors can be held liable, in accordance with the BCC, for shortcomings in their management of the company, breach of rules of law or the articles of association and, in certain cases, violation of their general duty of care (the relevant standard is how a reasonably prudent director would have acted under the same circumstances). The general meeting of shareholders has the power to initiate proceedings on behalf of the company against one or more directors on the above-mentioned grounds. Such a decision should be approved by a majority of votes cast. No action can be taken if the general meeting has already discharged the directors. There is also a possibility for minority shareholders to initiate the same proceedings on behalf of the company if they represent at least 1 per cent of the voting securities or hold at least €1.25 million of the company’s capital on the day the general meeting voted to discharge the directors. Minority shareholders that validly approved the discharge cannot bring such proceedings. At the request of one or more shareholders holding at least 1 per cent of the total voting rights or securities that represent at least €1.25 million of the company’s capital, the court may also appoint, if there are indications that the interests of the company are seriously jeopardised or could be jeopardised, one or more experts to verify the company’s books and accounts and the actions of its corporate bodies. In certain cases, one or more shareholders can also request the appointment of a temporary administrator to manage the company in lieu of the board of directors. The BCC provides for the possibility to solicit proxies for certain shareholder meetings. This solicitation should, however, comply with the requirements of the BCC.31 A public solicitation of proxies (i.e., when advertisements or intermediaries are used or if more than 50 shareholders are targeted) should be approved by the FSMA and a number of requirements should be met.32 Proxy solicitation is mostly done by associations that defend (minority) shareholders’ rights. Several associations that defend (minority) shareholders have campaigned to involve as many shareholders as possible in certain proceedings (e.g., the Fortis case in 2008, the case against the National Bank of Belgium in 2010, the Lernout & Hauspie case, the Madoff case and the Lehman Brothers case). Pursuant to the Act of 28 March 2014,33 class actions are now possible in Belgium. However, certain limitations apply. A class action may only be brought: (1) against a company; (2) by a consumer; and (3) for breach of a contractual obligations or a specific law. Thus, shareholders who would like to introduce a claim against (current or former) directors cannot bring a class action under Belgian law. Therefore, only investors that take part in the proceedings against a company have the right to claim damages. Capital increase with the issuance of new shares: in principle, only the general meeting of shareholders is entitled to increase the company’s share capital, unless the board of directors has been authorised to do so (pursuant to the Company Code). However, such an authorisation is not valid in the context of a takeover bid, during which the board, in principle, cannot increase the share capital by means of a contribution in kind or in cash with cancellation or restriction of the shareholders’ pre-emptive right. The general meeting may, however, authorise the board of directors to increase the share capital during the offer period by means of a contribution in kind or in cash with cancellation or restriction of the shareholders’ pre-emptive right, provided (1) the board has been specifically authorised to do so within the past three years, (2) the newly issued shares are fully paid up, (3) the number of new shares does not exceed 10 per cent of the number of existing shares, and (4) the subscription price is at least equal to the offer price. Acquisition of own shares by the company: in principle, the general meeting of shareholders must authorise the acquisition of own shares by the company, unless the board of directors has been authorised to do so (pursuant to the Company Code). However, such an authorisation is not valid during a takeover bid, as from the time the company is notified of the bid by the FSMA. As an exception to this rule, the board may acquire own shares to avoid serious, imminent harm to the company, provided the articles of association so allow (for a maximum period of three years). In this case, other conditions governing the acquisition of own shares also apply (e.g., the acquisition may not exceed 20 per cent of the issued share capital). ‘Poison pill’: in general, certain advance measures are available to protect companies against potential takeover bids. However, pursuant to Article 556 of the Company Code, only the general meeting of shareholders (thus not the board) can grant rights to third parties liable to affect the company’s assets or give rise to a debt or obligation on behalf of the company, when the exercise of the rights depends on the launch of a takeover bid or a change in control. To be valid, the resolution to this effect should be filed with the clerk’s office (of the competent court) prior to the FSMA’s notification of the bid to the company. During the offer period, only the target company’s (general meeting of) shareholders can take decisions or execute transactions that could have a significant impact on the composition of the company’s assets or liabilities or enter into transactions without effective compensation. Such decisions and transactions cannot, in any case, be made subject to the outcome of the bid. Decisions that have been sufficiently implemented prior to receipt of the FSMA’s notification can be further executed by the board; however, the FSMA and the bidder should be immediately notified of any such decisions, which should also be made public. Issuance of convertible bonds or subscription rights (warrants): these instruments may be issued by the general meeting of shareholders and may, for example, be convertible or exercisable upon the launch of a takeover bid. It is also possible to create a pyramidal ownership structure or issue share certificates. As a general rule, in keeping with the Takeover Directive, the target company’s board of directors must act in the company’s interest. It may therefore seek out an alternative bidder (or white knight). Belgian law specifically provides that the target company need not inform the FSMA of the fact that it is searching for an alternative bidder (while it should inform the bidder and the FSMA of any decision in relation to the issuance of shares or that is liable to frustrate the bid). Belgium has opted out of the provisions of the Takeover Directive aimed at restricting the use of defensive measures by the board of directors. Nevertheless, companies with their registered office in Belgium and whose shares are (at least partially) listed on a regulated market may voluntarily include such restrictions in their articles of association (i.e., opt in). provisions of the articles allowing a shareholder to appoint or remove a director shall not apply at the first general meeting called by the bidder after the offer, provided the bidder holds at least 75 per cent of the target’s capital as a result of its bid. If the rights set out in (c) to (e) cannot be exercised, reasonable compensation should be paid to their holders. The company may also stipulate in its articles of association that such provisions shall only apply to the extent the bidder or the company controlling the bidder is subject to the same restrictions on the application of defensive measures (the reciprocity rule). The use of staggered boards as a takeover defence is not relevant in Belgium, as a director of a public limited company can always be removed at will by the general meeting of shareholders. The basic rule is that the company should treat all similarly situated shareholders equally. The Royal Decree of 24 November 200734 regulates periodic (annual and semi-annual) and occasional information (i.e., inside information) to be disclosed by listed companies, in addition to the mandatory disclosures set out in the BCC (e.g., annual accounts and annual reports). Periodic information should be disclosed quickly and on a non-discriminatory basis so that it can reach as many people as possible, and disclosure should take place, insofar as possible, simultaneously in Belgium and other Member States of the EEA. The company should use media that are expected to ensure disclosure in all Member States of the EEA. Any inside information should be disclosed as simultaneously as possible to all categories of investors in the Member States where the company has requested or agreed to trade its financial instruments on a regulated market. The 2009 Code stipulates that the company should design a disclosure and communications policy that promotes effective dialogue with shareholders and potential shareholders. Individual meetings with institutional investors are also encouraged to receive explanations on their voting behaviour. It is indeed common practice for companies to hold individual meetings with their controlling shareholders, institutional shareholders, or both. However, the information disclosed in these meetings should be information that is already public or that is made public at the same time, to avoid the unequal treatment of shareholders. Each director has a duty to keep information about the company confidential unless required to disclose it pursuant to a statutory or ethical duty. This duty also extends to the company’s shareholders. Some scholars argue, however, that directors representing a controlling shareholder can consult with that shareholder on decisions to be taken by the board of directors and the position the director will adopt in future deliberations, unless the board of directors specifically decides otherwise. This does not mean that the directors can inform the person they represent of information he or she can then use for his or her own purposes (e.g., to determine whether to sell or purchase shares). In addition to this general duty of confidentiality, it is also forbidden for anyone in possession of inside information (e.g., directors) to, inter alia, disclose such information to anyone else except in the normal course of business or in the performance of his or her professional duties. The general rule is that inside information should be immediately disclosed. However, the company can decide, at its own risk, to postpone the disclosure of inside information if the disclosure could harm the company’s legitimate interests, provided that the delay in disclosure does not mislead the public and confidentiality can be guaranteed. If inside information is disclosed in the normal exercise of the discloser’s profession, function or work, the information should simultaneously be made public unless the person to whom the inside information is disclosed is bound by a duty of confidentiality (e.g., the printer or the communications department). If the disclosure of inside information is postponed, the company should take the necessary measures to, inter alia, bar access to this information to all persons who do not need it to exercise their functions. Based on the foregoing, in our opinion, directors cannot disclose inside information to a shareholder further to a confidentiality agreement. The only exception to this rule is if a third party or a shareholder requests information from the company to determine, for example, the appropriateness of making a public offer, in which case the board of directors can grant access to the information in question if it enters into a confidentiality agreement that includes a standstill clause (i.e., no transactions in the company’s shares until the information has been made public) and provided disclosure is in the company’s interest. The Belgian legislature is currently investigating and discussing a thorough modernisation of the Company Code, including corporate governance-related areas such as the corporate organs (e.g., the one-tier two-tier principle) of a public limited company, the abolition of certain corporate forms (such as the partnership limited by shares), changes to the definition of listed company, etc., which could impact the corporate governance of listed companies and result in a need to update the Corporate Governance Code. Moreover, some (minor) legislative proposals with respect to the remuneration of directors and management have been made. A proposal to provide that listed companies are obliged to disclose the difference between the median salary of executive directors and the median salary within the company as a whole, a proposal to ensure employee representation on the remuneration committee, and a proposal obliging listed companies to draw up a corporate responsibility report are all pending. It is now possible to perceive the level of implementation of corporate governance legalisation and whether companies comply with the rules. Several studies are being carried out (e.g., by the FSMA, VBO and GUBERNA) and the Corporate Governance Committee continues to follow up on the progress of and compliance with the corporate governance rules, issuing advice where necessary. In 2013, the Corporate Governance Committee decided that it is not yet necessary to update the 2009 Code, based on an independent study conducted in September 2012 indicating that, overall, the 2009 Code and Belgian law are characterised by an above average implementation of EU corporate governance requirements and that, in future, the main changes to the 2009 Code and Belgian law are expected to result from changes at the EU level, at which many changes in the field of corporate governance are expected. On 12 December 2012, the European Commission approved a new action plan outlining future initiatives in the areas of company law and corporate governance for the purpose of improving corporate competitiveness and sustainability. The action plan identifies three main areas for action: enhancing transparency, increasing shareholder engagement, and supporting corporate growth and competitiveness. These goals are to be achieved through the implementation into the national laws of the Member States of 16 different actions considered fundamental. strengthening the transparency rules applicable to the voting and engagement policies of institutional investors. investigating whether employee share ownership can and should be encouraged. In addition, the action plan foresees improvement of the statutory framework for cross-border transactions and the unification of all major company law directives into a single instrument. This would make European company law more accessible and comprehensible and reduce the risk of future inconsistencies. Certain measures proposed by the European Commission have already been implemented in Belgium, such as the right of the shareholders of a Belgian listed company to vote on and approve the remuneration policies of the company’s executive directors and the remuneration report. However, many of the proposed measures will require legislative initiatives that will apply either to only listed companies (e.g., voting policies of institutional investors) or to all companies, listed or unlisted (e.g., provisions on cross-border divisions). the possibility for listed companies to request information on the identity of their shareholders from intermediaries and the facilitation of the exercise of shareholders’ rights (e.g., voting rights), in particular in cross-border situations. On 8 July 2015, a press release was issued indicating that the European Parliament, Council and Commission are expected to try to reach an agreement on the text of the proposal in informal meetings, so that the directive can be formally adopted at first reading. The European Parliament also passed a resolution on a proposal for a directive of the European Parliament and of the Council on improving the gender balance among non-executive directors of companies listed on stock exchanges and related measures. The resolution strives to ensure equal access for both women and men to non-executive positions on boards of listed companies so that by 2020, at least 40 per cent of non-executive directors’ positions are held by women. If the directive is adopted, the relevant provisions of Belgian law (Article 518 bis BCC) will need to be modified as they currently provide that only 30 per cent of the directors of a Belgian listed company should be women, as from 2017. 1 Elke Janssens is a partner at NautaDutilh in Brussels. 3 There is an inconsistency between the Dutch version of the 2009 Code, on the one hand, and the French and English versions, on the other; the latter only refer to ‘companies whose shares are listed on a regulated market’. 4 Publieke Veilingen/Ventes Publiques, Trading Facility and Easynext, organised by Euronext Brussels, and MTS Belgium, MTS Denmark and MTS Finland, organised by MTS Associated Markets SA, are also MTFs but are rarely used. 5 An important reform of the BCC is scheduled to take place in the course of 2017. The Minister of Justice established a non-profit organisation composed of corporate law experts with an academic background two years ago and this non-profit organisation is working on the new draft of the BCC. 6 Act of 28 July 2011 amending the Act of 21 March 1991 on the reform of certain economic public undertakings, the Company Code, and the Act of 19 April 2002 on the functioning and management of the National Lottery, to guarantee that women are represented on the boards of directors of public undertakings, listed companies and the National Lottery, published on 14 September 2011 in the Belgian State Gazette. 7 Since most listed companies in Belgium take the form of an NV/SA, the governance structures of other corporate forms are not discussed in this chapter. 8 This recommendation has not yet been incorporated into the 2009 Code, nor has the BCC made this recommendation part of the reference corporate governance code (the 2009 Code). 9 There is an inconsistency between the French and Dutch text of Article 518 bis BCC. The French version refers to the ‘free float’ while the Dutch version refers to ‘the value of freely negotiable shares’. In our opinion, the French version is correct, since it appears that the Dutch text has not been fully updated following an amendment to extend the scope of the act from listed shares to listed securities. 10 Listed companies that meet at least two of the following three requirements on a consolidated basis: (1) fewer than 250 employees on average during the financial year, (2) a balance sheet total of less than €43 million, and (3) net annual turnover of no more than €50 million. 11 Applicable as from the first day of the first financial year starting after 14 September 2011. 12 This sanction is applicable as from the first day of the seventh financial year commencing after 14 September 2011. For listed companies whose free float amounts to less than 50 per cent and for small listed companies, this sanction is applicable as from the first day of the ninth financial year commencing after 14 September 2011. 13 There is an exception for small listed companies that meet the criteria set out in Article 526 quater Section 4 BCC. In that case, no remuneration committee need be set up. Rather, the board of directors will perform the duties of the remuneration committee and should have at least one independent member. If the chairperson of the board is an executive director, he or she cannot chair board meetings when the board is acting as the remuneration committee. There is also an exception for public undertakings for collective investment with variable capital, within the meaning of Article 10 of the Act of 20 July 2004 on certain forms of collective management of investment portfolios, and for companies whose business is the issuance of asset-backed securities, as defined in Article 2(5) of Commission Regulation (EC) No. 809/2004. 14 In accordance with the requirements set out in Article 526 ter BCC. 15 There is an exception for small listed companies that meet the criteria set out in Article 526 bis Section 3 BCC. In that case, no audit committee need be set up. Rather, the board of directors will perform the tasks of the audit committee and should have at least one independent member. If the chairperson of the board is an executive director, he or she cannot chair board meetings at which the board is acting as the audit committee. There is also an exception for public undertakings for collective investment with variable capital, within the meaning of Article 10 of the Act of 20 July 2004 on certain forms of collective management of investment portfolios, and for companies whose business is the issuance of asset-backed securities, as defined in Article 2(5) of Commission Regulation (EC) No. 809/2004. 16 In accordance with the requirements set out in Article 526 ter BCC. 17 This rule applies to any agreements entered into or renewed as from 3 May 2010. 18 For non-executive dependent directors, this rule applies to any agreements entered into or renewed after 3 December 2011. 19 Holding directly or indirectly a majority of the share capital or voting rights, having the power to appoint a majority of the members of the governing or executive body or to appoint a person entrusted with governmental supervision including by means of a contract. 20 Act of 19 December 2012 on the remuneration of employees and office holders in institutions of public utility, autonomous governmental companies and legal entities over which the state exerts, directly or indirectly, a preponderant influence, published in the Belgian State Gazette on 28 January 2013, entered into force on 1 August 2013. 21 Article 526 ter BCC. 22 Some of the provisions also apply to companies whose securities or shares are listed on certain MTFs. 23 The latter is applicable to companies whose shares or debt instruments are listed. 24 Act of 1 April 2007 on public takeover bids. 25 These requirements are applicable to companies whose shares are listed on a regulated market. The requirements under (a), (b) and (i) are also applicable to companies whose securities, other than shares, are listed on a regulated market when their shares are listed on an MTF. The requirement set out under (c) is also applicable to companies whose securities are listed on a regulated market. 26 The term CEO can refer here to the main representative of the executive directors, the chairperson of the management committee, the main representative of ‘other leaders’ or the main representative of the persons entrusted with daily management of the company. 27 ‘The first legal remuneration reports: second follow-up study of Study No. 38’ – December 2012 (available at www.fsma.be). 28 This recommendation has not yet been incorporated into the 2009 Code, nor has the BCC made this recommendation part of the reference corporate governance code (i.e., the 2009 Code). 29 Except as mentioned in Article 560 BCC. 30 It is generally accepted that, in certain cases, some powers can be delegated. 33 Act of 28 March 2014 on class actions, Belgian State Gazette, 29 April 2014. 34 Royal Decree of 24 November 2007 on the obligations of issuers of financial instruments traded on a regulated market, Belgian State Gazette, 3 December 2007.